Hannah Valantine, M.D. 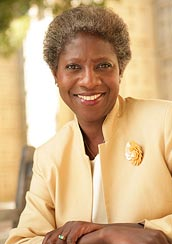 is NIH’s Chief Officer for Scientific Workforce Diversity. Today marks an important step forward for NIH’s support of a diverse scientific workforce. NIH has announced the awardees of unique, targeted programs for developing new approaches to engage researchers from underrepresented backgrounds and for preparing them to thrive in scientific careers. NIH has issued 12 awards, amounting to nearly $31 million in fiscal year 2014 funds. To recap, these new programs, supported by the NIH Common Fund, were established in response to recommendations by NIH’s Advisory Committee to the Director Working Group on Diversity in the Biomedical Research Workforce. As I discussed previously, the Working Group report highlighted that the biomedical workforce lacks diversity which, in part, can be traced to the small pool of students and trainees from underrepresented groups who successfully traverse the pipeline and make it out the other end into research careers. NIH has made a commitment to understand why there is a dearth of diversity in our workforce and will use this knowledge to create programs that help our young talent from all backgrounds choose careers in biomedical sciences and succeed. The new NIH diversity programs announced today aim to do just that, by helping us understand cultural, social, and psychosocial factors that influence retention in biomedical research careers, and by integrating findings from social science research to create effective research training and education models. The new “Enhancing Diversity in the NIH-funded Workforce” programs are a tightly integrated set of three programs that will work as a consortium to provide real-time evaluation and dissemination of successful approaches to training and mentoring. The Building Infrastructure Leading to Diversity or BUILD initiative has the long-term goal of catalyzing cultural changes at academic institutions so that the best and brightest students are well-prepared to enter research careers. The BUILD awards announced today will allow the development and testing of novel models for underrepresented student recruitment and retention in training within the biomedical sciences. Also announced today is the NIH National Research Mentoring Network (NRMN) which will facilitate the development of robust mentoring relationships through the coordination of nationwide pairings of scientific leaders and early career scientists (undergraduate students through junior faculty members). Strong mentoring has been shown to have a powerful impact on individuals from underrepresented groups. Mentees benefit from mentors who share common experiences and can help them navigate the complex issues that often arise during a person’s early career. Finally, NIH is supporting a coordination and evaluation center, which will work with BUILD and NRMN recipients on gathering and analyzing metrics on their programs. This center provides the critical glue that holds all of these components together, as evaluation of the programs’ impact on diversifying our workforce is vital to understanding what programs work, for whom and in what context, and will allow NIH to share effective training and mentoring practices broadly. You can read more about these programs and their awardees on the NIH Common Fund website. We are thrilled to see these programs launched, and we have high expectations that our biomedical research ecosystem will be even stronger with a diverse pool of extraordinary scientists whose expertise and ideas can propel us towards our goal of improved health for all. This entry was posted in blog, Rock Talk and tagged Award Programs, Biomedical Workforce, Diversity by Hannah Valantine and Sally Rockey. Bookmark the permalink. We are happy to see a push for more diversity. More brains with varying backgrounds will only provide more innovative ideas into the community. And afterall, science is universal, so everyone should be involved. This program is poised to be much more effective than previous efforts as innovative ideas will lead the way. Interesting that this is the response to the Ginther report showing that *existing* PIs who are African American suffer discrimination in grant award success. What good will it do to increase the population of African American investigators seeking funding if they are still fighting a rigged game to get funded? These new programs were created to specifically address disparities in the educational pipeline, as recommended by the ACD diversity working group. As described in their report, disparities exist beyond the faculty-level pool, and are persistent throughout research training and education. These programs provide support throughout the early stages of the research workforce continuum. That didn’t answer the question of why you chose to prioritize the think least likely to produce immediate and tangible improvement *as well as downstream effects on pipeline issues greater than fancy talking*. The reality of a successful, diverse PI population does far more to encourage POC to try for a science career than a bunch of empty promises ever can. I agree. The NIH missed the boat and further missed the opportunity to correct both a critical wrong and a misguided course. There were three possible responses to the Ginther report: 1) That minority grant applicants are inferior (although the methods matched minority and non minority applicants for publication record and career status) 2) There is bias in the system 3) There is insufficient data or methodologies to determine what is going on. Instead of choosing the correct interpretation (#2), the ACD and the NIH chose to dodge the question (and thereby miss the boat) by ruling that minority applicants are inferior due to deficiency in training and or experience and that there was insufficient data to support existing bias. This led to the 31 million dollars (to mostly non minority investigators) to “train” new minority investigators. What the NIH fails to recognize is that correcting discrimination and support of existing minority investigators does far more to support diversity in science than does giving money to majority investigators to “train” new minority investigators. This mistake has been the track record for the NIH– observe the lack of diversity in big programs (child health study, etc) as well as the RO1 granting mechanism. This same mistake is committed by NIH in its intramural program as well– just look at the number of tenured minority investigators exist, or further look at the experience of those who have tried to get tenure. While I commend this program for students and early career scientists, I do agree that there is not much NIH support for diversity at the assistant professor and higher level that is readily available. As a female, native Pacific Islander and mentor of many students of diversity – I have inquired about specific programs to promote diversity, specifically for first time R01 applicants (with of course meritorious science proposals), and have not been informed of any by staff members. Also, I would actually like to see money directly towards student support rather than programs to examine how to support students of diversity. Since August of this year, certain NIH institutes were already out of funds for their supplemental grants to Promote Diversity in the Workplace (PA-12-149) and the Indian Health Services also had no funds to help support promising Native American students in research. Diversity within the research community is an enormous gain in public health. Additionally, the insight of NIH’s leadership to implement an aggressive plan to promote and ensure diversity within the research and academia communities, is the type of forward thinking leadership needed to enhance society’s quality of life. I am very happy to see this initiative but I do feel that there remains one underrepresented minority that is not considered in any of these programs, namely, persons with significant disabilities. I do not believe that there is enough appreciation of how much a life-changing disability can impact one’s ability to do science – for example, many medications for syndromes such as epilepsy can cause drowsiness, althered mentation, and other problems, as can insulin. Likewise, treatments for some physical disabilities can require continous and time-consuming medical oversight or intervention (e.g., physical therapy). All of these can impair productivity and should (but are not) be taken into consideration during peer review.